Glittering Cookie Wands | What Smells So Good? Made with vegan cream cheese, vanilla sugar, and a secret ingredient, these crisp sticks are a fantastic addition to a child's birthday party or the Harry Potter fan club table! I grew up with the Harry Potter book series, falling in love with the characters and their antics over the years. The series holds a special sort of "magic" for me as a big sister and a teacher as well - while Beatrix Potter, Hans Christian Andersen and C.S. Lewis failed to get my little sis (and many of my past students) turning pages, the adventures of Harry, Ron and Hermione opened their minds and hearts to reading for pleasure. As a result, it's nigh impossible to get my sister to put down a book today, and our shelves are thoroughly laden with reading material. 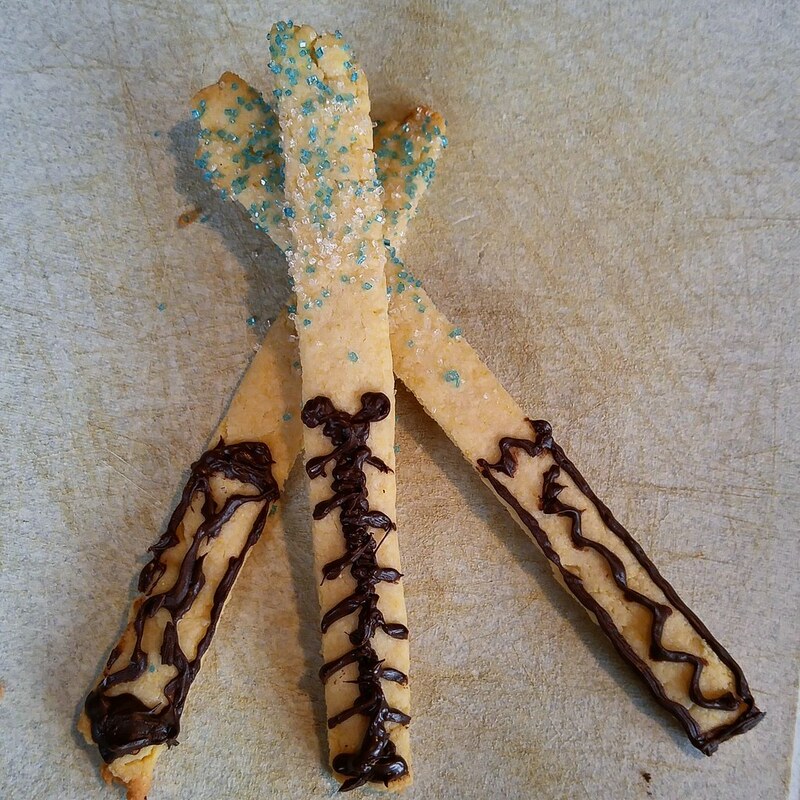 Since school, with all it's bake sales and birthday parties, is back in session after the winter break, I thought it would be fitting - and I daresay, cute - to make some "magic wand" cookies for a bit of sparkle. While I may not be a huge fan of standard sugar cookies - for too sweet, dry and bland for my tastes - I do like those made with a touch of cream cheese. Cream cheese has long been a favourite cookie ingredient of mine, since it adds just a hint of tang and a tenderness you can't get otherwise. I found a good base recipe on Keepin' it Kind, which had not only cream cheese but cornmeal for a bit of extra texture and a touch of sweetness. Since I was making long, skinny cookies that were more prone to breakage, I opted to swap out the vegan butter for non-hydrogenated shortening which made the dough a touch sturdier. I also used vanilla sugar instead of plain and white whole wheat flour for a touch of added nutrition. The dough freezes exceptionally well, and the batch size is perfect for a child's birthday party where cookie decorating is one of the activities (do people still have birthday parties at home anymore, with pizza and homemade cake? They should!). If you need to serve a crowd, say a pre-fan convention party, you can double, and even triple the recipe. Bust out the sprinkles (and the dark chocolate if you're feeling fancy) and get to making some cookie magic! Combine flour, cornmeal, and salt in a medium bowl and set aside. Beat the butter, sugar, and cream cheese together. Stir flour mixture in a little at a time. Wrap in plastic and refrigerate overnight (or freeze up to 6 months). Working with one quarter at a time, roll into a rectangle about 5” long and ¼” thick. Cut into strips about ½” wide. Carefully transfer to a parchment lined baking sheet. Repeat with remaining dough. Cool completely before decorating the “handles” with chocolate”.